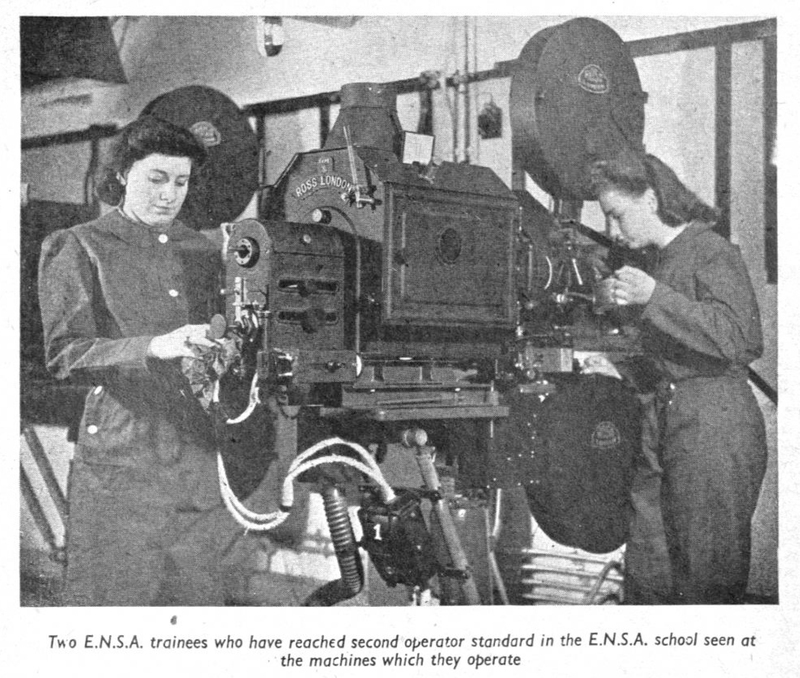 Two women projectionists training at the Entertainment National Service Association (E.N.S.A.) projection training school in 1942. Used with permission from Screen International. Florence Barton, who worked as a sales-person in a Coventry cinema, was one of these 'projectionettes' and in the audio clip on the left she describes her move into the box. Perhaps moreso than during the first world war, the position of women in the projection box was seen as acceptable. In this short silent newsreel item from the Huntley Archive we can see a woman projectionist screening a propoganda film for an audience (uncluding a number in unifirm) with absolute professionalism. Florence Barton describes the process of becoming a projectionist in Coventry during the Second World War. A short, silent news item depicting a 'projectionette' showing films for a wartime audience.